We…we need to talk. I don’t know how to say this. Maybe you should sit down. In fact, you might need a stiff drink. You see, I’ve…I’ve been keeping something from you. A secret. For months now. I know, I know, I had no right. It probably turns your stomach just to think about it. The fact is, I just can’t live with the guilty anymore. I’ve got come clean. To shine a light on my deceptions. The thing is, I’ve got a new hobby. I’ve been working on it since the first of the year. I’ve…I’ve been…baking bread. What? You’d expected that I killed a man or something? I mean, come on. How salacious could my “secret” really have been? I’m a software engineer who rights fantasy novels. I’m not exactly 007, you know. Ahem. 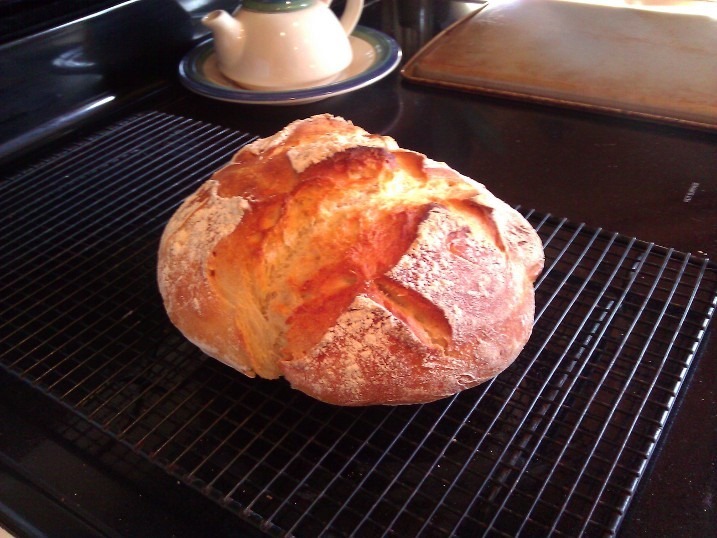 Back to the point: yes, I’ve been baking bread. With my own hands. In my home, in full view of the children and everything. Regularly. And I’m not even sorry about it. Because not only is it not really taking up too much of my time, it’s delicious. Of course, I realize the first question is probably “why?” I mean, I live suburban American, after all. There’s, like, 1562 places for me to buy bread within 30 second drive radius from my house. Why on Earth go to all the trouble to make bread by hand, of all things. There are two main reasons. First, I realized that when the Zombie Apocalypse finally comes, I didn’t have a good means of feeding my family. Sure, I’m pretty confident we’ll be able to get away from most populated areas fast enough to survive the first wave, but what happens then? I certainly don’t want to have to go skulking back through the remains of civilization a week later because our supply of Doritos and DIng Dongs is bottoming out. Let’s face it, skulking isn’t my strongest suit. I’m more the “lumber around noisily and pray I don’t trip over my own graceless feet” type. Which, incidentally, not only puts me at a disadvantage when it comes to surviving return trips to the Super Target, but also limits my ability to feed the kids venison brought down by my own hands. Speaking of hunting, I do realize that most modern day game hunting involves more waiting in an uncomfortable booster seat concealed in a tree than any actually stalking prey, but I have the attention span of a toddler after 30 minutes in a room full of Airheads and a like ability to sit still in a seat for any length of time. So regardless of the fact that “hunting” these days really ought to just be called Big Game Waiting, I’m have no skill with either. The good news is, I do, know how to brew beer, so as long as there’s a source of water handy* we won’t go thirsty, regardless of whether or not said H2O is generally safe to drink (aka, non-Monsanto’d). Which means we only need a reliable source of food in order to survive. And then I realized, hey, bread would probably do it! The second (and somewhat less ridiculous) reason I decided to start baking my own bread is because one day last year, I forgot to make toast. And it scared the hell out of me. What happened is that one day, a happy-go-lucky dude (we’ll call him, um, Puddin) decided to take a couple of pieces of common, everyday packaged supermarket bread (think Wonder™, but a wheat variety and not exactly Wonder™ the Brand) to work with him for breakfast. But, as happens, work bonfires smacked him in the pudgy, bearded face the moment he walked in the door. Any forlorn hope of breakfast was soon forgotten. As was the bread in question. Thus, those two pieces of Wonder™-like-but-not-actually-Wonder™-brand wheat bread sat on his shelf, looking over his shoulder for days. The days became weeks, and then the weeks became months, but never did our friend, (uh, what was his name? oh,yeah…) Puddin think of it again. Until another day came, near the end of the year, when he found it. Now, knowing it had been waiting there, literally, for months, he crinkled his nose and squinted at it, expecting it to be hard and moldy and basically something worthy of study by high school students everywhere. Imagine his surprise, then, to find It. Was. Not. Not moldy, not hard, not showing any sign of having been forgotten for, literally, months, on a dusty shelf. My friends, plastics should behave this way. But foods? Maybe ham or jerky, stuff that has been cured and/or dried for long term use. But bread? No, bread should not demonstrate a tendency towards immortality. Yeah, I don’t know what they’re putting in Wonder™-like-but-not-Wonder™-brand wheat bread these days, but whatever it is, I’m pretty sure it isn’t natural. Or wholesome. Or of this plane of existence. Fearing, then, that the Great Underlord of the Darkness Below was attempting to siphon my soul away with pre-packaged bread, I decided the time had come to learn to make it myself. But, oy, bread. Such work! 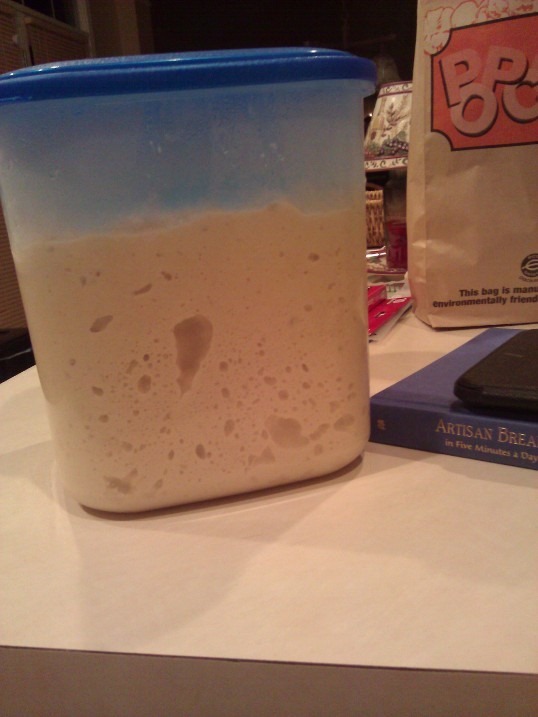 With the mixing and measuring and the kneading and the proofing and the…ugh. The thought alone was almost too daunting to contemplate. Thankfully, just before I gave up and decided to take The Lazy Man’s Only Real Alternative and succumb to the Soul-Killer Bread, online friend and picture book writer extraordinaire, Julie Falatko, pointed me in the direction of a book that would save us all. 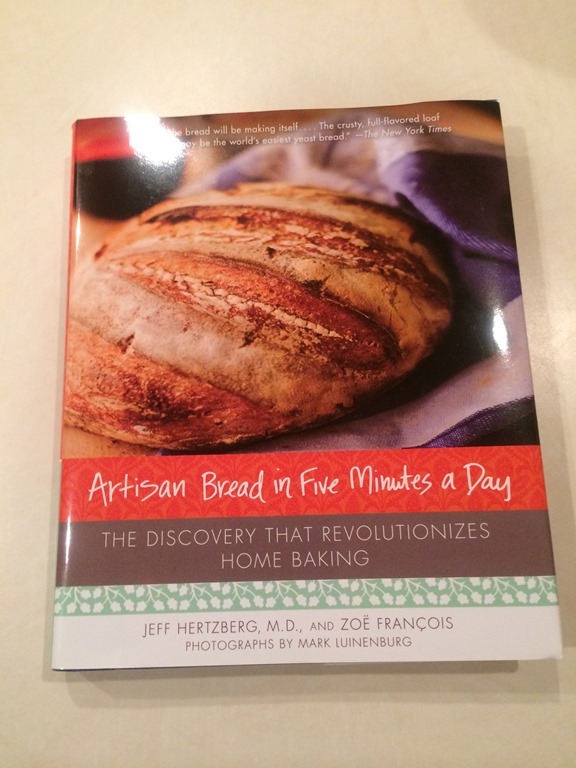 I’m rambling, of course, about Artisan Bread in Five Minutes a Day. And, yes, if you want to avoid the Bread of Soul Death, you’ll want to learn everything you can about it. I’d start at the website. I received the book in question for Christmas. See? This is how my copy looks on the counter at home. Purty, right? I haven’t looked back since. I daresay that the method laid out in the book is so easy, even for a Captain McSlothypants like me, there hasn’t been a single day between my first attempt at loaf-baking and today that we haven’t had real, home-baked bread available at la Casa de Puddin. All you have to do is mix up a batch of sticky dough like this, and keep it in the fridge until you’re ready to use it. Then you pull some out and shape it however you want. 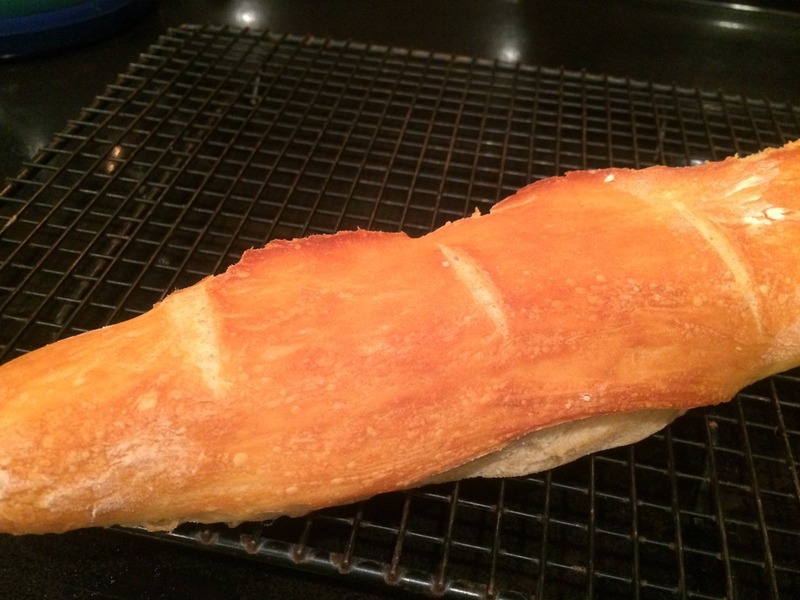 Sometimes I make French-style baguette-type things. Other days I get out the loaf pan, because I’m too lazy to even do basic shaping. Which really doesn’t save much time at all, because rolling dough into a ball and just lettin’ it rip turns out some perfectly lovely, tasty goodness too. In fact, the absolute best thing about the Artisan Bread in Five Minutes thing? 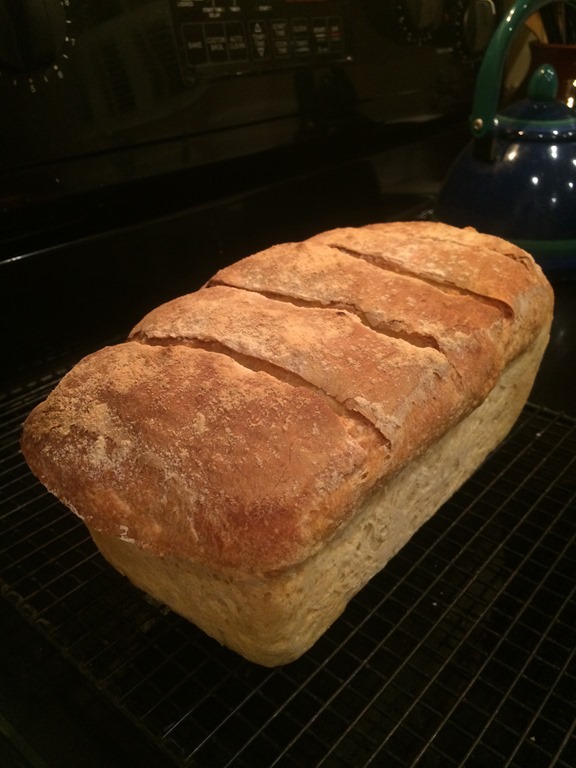 Even if you don’t feel like making bread at all (as I didn’t last night), you tend to literally spend more time trying to talk yourself out of it than it actually takes to prep a loaf for baking. I’m not kidding, I sat in my Middle Aged Guy Recliner of Comfort for five full minutes last night trying to come up with a good reason not to bother, but ninety seconds after I got off my loafing behind** I had my dough formed and set, ready to go. And if that’s not the perfect hobby for a guy like me, especially considering it results in tasty bready goodness, well, I just don’t know what is. *Yeah, yeah, I know I’ll need malt or some kind grain and something hop-like. But I’m sure I’ll find something suitable. **Loafing. Get it? Lazy? Bread? Heheheh. Ah. Um, sorry. “Doritos and DIng Dongs is bottoming out”. – How can you speak of such evil?? #2. You could at least share a loaf occasionally!!! !